Highlights from Tottenham's win over Watford in the Premier League. Late goals from Heung-Min Son and Fernando Llorente rescued a tough week for Tottenham with a 2-1 comeback win over Watford. Watford took advantage of a Spurs side looking jaded after exiting both domestic cup competitions in the space of four days when Craig Cathcart bundled home from a corner (37). But the introduction of Lucas Moura at half-time proved the catalyst for a much-improved home performance and Llorente missed an open goal from four yards amid increasing pressure from the hosts. He redeemed himself though, providing a smart assist for Son to smash home 10 minutes from time before arcing a header into the far corner from Rose's cross (87) for a dramatic winner, which moves Tottenham to within two points of second-placed Manchester City. Tottenham: Lloris (6), Aurier (5), Alderweireld (7), Sanchez (7), Vertonghen (7), Rose (8), Winks (7), Sissoko (6), Eriksen (5), Son (8), Llorente (7). Subs: Moura (7), Trippier (6), Lamela (6). 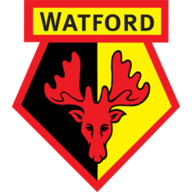 Watford: Foster (7), Janmaat (6), Mariappa (7), Cathcart (7), Holebas (7), Hughes (6), Cleverley (6), Capoue (7), Pereyra (6), Deeney (6), Deulofeu (5). Subs: Success (5), Wilmot (7). Tottenham were still far from their fluid best despite the return of Son and a refreshed Eriksen, but on the odd occasion they upped the tempo they looked capable of hurting Watford. Son's rapid turn and shot from the right almost caught out Ben Foster, who was left rooted to the spot but grateful to see the South Korean's effort flash wide of his right-hand post. But it was Watford who took the initiative and held a half-time lead courtesy of Cathcart, who returned to haunt Tottenham after scoring the winner against them in September, rising to nod Jose Holebas' corner goalwards and, thanks to a sizeable deflection off Davinson Sanchez, finding the back of the net. Moura's introduction, and whatever Mauricio Pochettino said at the break, made an instant impact on Spurs' second-half performance and they should have levelled when Llorente met Moussa Sissoko's cross from the right, forcing a stunning reaction save from Foster, but with the goal gaping from the rebound, the ball cannoned over the bar off his knee. Spurs' pressure finally told 10 minutes from time when Llorente brought down a ball down the right and fed it into Son's path. The returning South Korean showed Spurs what they had missed in his absence at the Asian Cup by taking a touch and firing in a powerful equaliser. Tottenham welcomed back Heung-Min Son at the first opportunity to partner Fernando Llorente. Eric Dier and Kieran Trippier dropped to the bench for Erik Lamela and Davinson Sanchez. Will Hughes and Craig Cathcart returned from injury for Watford with Daryl Janmaat back for Kiko Femenia. 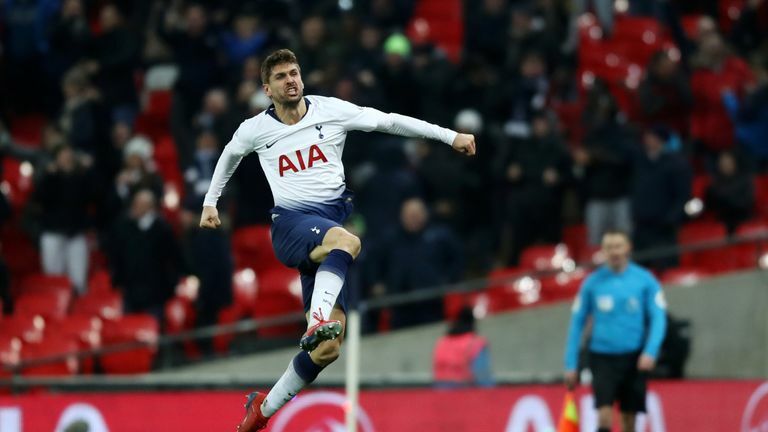 And Llorente completed the late turnaround Spurs' second-half performance merited with some old-fashioned number nine play, lifting a header from Rose's excellent delivery back across Foster and just inside the far post. Thanks to Liverpool's draw with Leicester victory enhances Tottenham's slim title hopes, lifting them seven points off the top, and more pressingly as many ahead of Chelsea after their thrashing at Bournemouth. Tottenham (54 points) have at least four more points after 24 Premier League games than they have ever had at this stage of the competition, last recording as many at this stage in the top-flight during their title winning season back in 1960-61 (65 points - 3/pts for a win). Only against Arsenal (9) and Manchester United (10) have Watford lost more Premier League games against than they have against Spurs (8). Watford have now lost four straight matches at Wembley Stadium, only Brentford (5), Shrewsbury Town (5) and Newcastle United (7) are on longer current such losing runs than the Hornets. Tottenham have now matched Bolton's Premier League record of the most consecutive matches without a draw in the competition (28 - W21 L7). Spurs have scored 13 headed goals in the Premier League in 2018-19, their most in a single top-flight season since 1999/00, when they netted 16 under manager George Graham. Watford's Craig Cathcart is the first defender to score both home and away against Tottenham within the same Premier League season since Per Mertesacker did so for Arsenal back in 2012-13. Tottenham forward Son Heung-Min has had a direct hand in six goals against Watford in the Premier League (five goals, one assist), against no other side has he been involved in more (also six v Southampton). Javier Gracia (38) has now managed the joint-most matches in the Premier League for Watford, winning more games than any of the other four managers to take charge of as many (13), as well as boasting the highest points per game ratio of any previous Watford manager in the competition (1.26). Rose was excellent down the Tottenham left despite Watford's Will Hughes following him around like a shadow for much of the evening. He evaded the midfielfder's clutches late on just long enough to deliver a pinpoint cross for Llorente to head home to cap a fine performance in which he made as many key passes (3) as anyone on either side and provided easily the best quality from wide across the pitch. 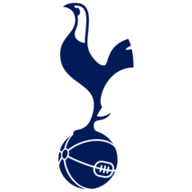 Tottenham are on the box on Saturday against Newcastle at Wembley, and are live on Sky Sports from 11.30am. Watford have a feisty-looking encounter with former manager Marco Silva against Everton at Vicarage Road at 3pm on Saturday.